In order to reinforce the significance and importance of this approach let us introduce this subject by means of an analogy. In addition, and as a bonus, this analogy also serves the purpose of revealing the human race's primary problem of who, what and why they are. We begin with a human who wishes to live in or spend time in a particular environment. However, this environment is incompatible to the human biology and physiology; it could be on another planet, which may possess heavy gravity and be in permanent darkness, etc. In fact we can imagine the whole of the human race planning to exist in this environment but we shall focus on one individual. Now, we point out that these humans have robots that they can utilise, which have been designed to be compatible with this new environment. The human in question now steps inside his robot, closes the door and interfaces his arms and legs, etc. into the appropriate mechanical appendages and components. Thus his arms and legs have bionic extensions and maybe he has bionic eyes that can see in the dark, wired to his own eyes. Note that we now have a human (organic) and combined machine (inorganic) cybernetics interface system. In the new environment we assume this individual is not highly familiar with this role of controlling the robot. Imagine now he wishes to execute a coordinated movement with one hand---imagine this as vividly as possible. He looks at this robotic hand, envisages the movement to be made, then rapidly transfers his attention to the feeling of where his human hand interfaces with the arm mechanism. He makes an appropriate movement of his own hand and quickly transfers his attention back to the external robotic appendage to see the result. This is repeated continuously. After a great deal of practice we can now imagine he becomes very skilful in this procedure, and eventually his attention focuses more on the external hand. In fact, in this analogy, we can imagine he---with time and practice---now doesn't have to put any attention on his own hand, and that this control of his own hand becomes unconscious; similarly for all other external manipulations, including the mechanical eyes. This is the condition of the human race today. We are controlled by the 'establishment', but we are not referring to those individuals or sources which have acquired information outside mainstream teachings and are consequently more informed in this regard; such sources as New-Age, religion, metaphysics, etc. Thus, using Figure 1, the CAUSE (control and creation) in the above analogy is the human in the robot, the true observer. The EFFECT and the feedback is from the robot's programs and, with respect to CAUSE, this is what is observed, that is, the environment (whether physical or mental). Thus we have what we can call 'mental empiricism' (experiential scientific evaluations; that is, are based on experience, observations and measurement---not thought alone). This will be clarified shortly. Our population today does not know who or what the human is, nor does it know the purposes of being on this planet. Current mainstream knowledge teaches that CAUSE in Figure 1 is an illusion, or just a byproduct of the brain activity and feedback. Note that the feedback mode communicates the activity of all imprints: memories, learning patterns, interface systems, all stored information, conscious or unconscious, including anything from conflict to trauma. 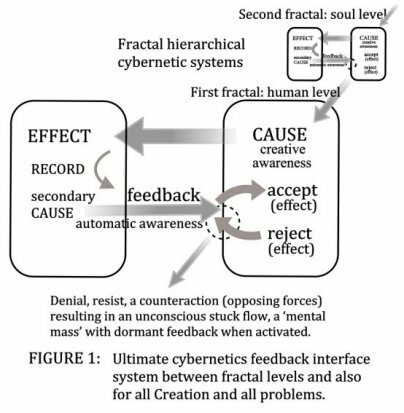 The shock here is that science recognises only the feedback activity and not the CAUSE; strictly it then means there is no cybernetic loop---and no feedback. The reason is that science questions the meaning and existence of CAUSE. Where does it come from? What does it consist of? In metaphysics, New Age and religion, of course, this input CAUSE is regarded as the soul or from the soul. We shall show that there is no problem as to the soul's origin when we understand the application of the infinite fractal scale. In the meantime the reader can regard CAUSE as a separate source in itself. Let us describe some applications of this cybernetic feedback loop, which covers all the senses, the thinking and learning processes and, in particular, the learning patterns in skills, that is, body movement. We also indicate how original creation comes from the mechanism of the observer/observed relation. Now as an example of cybernetics within the senses we shall take the visual process. Before optical discoveries were made in science, a typical opinion of the process of seeing was that sight is some kind of outgoing action. We open our eyes and the looking process goes out from the eyes to objects in the environment. Then along came science and showed that vision occurs when light reflects off objects and enters the eyes. In other words, we look at and experience images from the retina at the back of the eye. But in Figure 1 and 2 we can see that both processes occur: Feedback corresponds to the light entering the eye and merges with the outgoing attention (energy) from CAUSE. We shall explain what CAUSE is shortly. The computer or robotic mechanics of the feedback, consisting of extremely refined patterns of high to extremely high-frequency energies, is so advanced that this feedback blends and harmonises perfectly with CAUSE. In fact the mechanism can even copy emotion (of which the latter originates within CAUSE). Consequently it is not surprising that people do not realise who or what they are, and readily identify with their body, which includes the mind-computer robotics on the feedback side, that is, the EFFECT (and not the inner-self, or CAUSE of consciousness that science rejects as illusion). As we age, all these recordings from the senses, thinking and learning, continue to increase. Within the visual field, this means when we, as an adult, look at a familiar object, such as a wall, the subconscious mind activates all known data about walls and feeds it back to CAUSE. If there was an emotional element in the past, it has been recorded and now imprints its geometrical frequency pattern into CAUSE. This computer recording system has encoded the emotion as a programmed imprint. This imprint, when activated, embeds its information into CAUSE. This CAUSE is now 'moulded' by this pattern, which causes it (CAUSE) to re-create corresponding emotions in the 'now'. We can now explore the learning pattern, the mechanism of how we make physical movements of the body and develop skills---which has been covered thoroughly, previously, in particular in other books and website articles. Firstly, we can say that this learning pattern is an interface system between CAUSE and the computer bit-program patterns that are built up through practice. A definition of the learning pattern is: A 4D holographic template and interface system which houses programs and converts nonlinear information into linear information. In Figure 1 the feedback is now the organised recordings of the movements practised, and contains the hologram program of the learning pattern. Imagine practising some movement of a skill one wishes to learn, such as throwing a dart or playing a musical instrument, CAUSE (which contains the attention and consciousness, and is the control in this feedback loop), initiates the movement and guides it completely; that is, it supplies the energy and focus controlling our attention and awareness of what is happening. However, simultaneously the mind computer system records the movement at a rate of several times per second. When we (CAUSE) repeat the movement during practice, the recording pattern is played back; that is, a weak program path superimposes on CAUSE to assist it to improve the motion. Feedback and CAUSE now merge together, assisting symbiotically one another. It is a little like a pattern of grooves (of a template) which 'moulds' the CAUSE input; in effect, transferring the detailed pattern of the learning-pattern program in the feedback, which now focuses CAUSE, our awareness and attention, into all the details of the movements. Our consciousness now feels as though it is controlling every detailed movement of the body (for example, of the hands and fingers in piano playing). Thus there is both full instantaneous control and at the same time there is a completely programmed and automatic system in operation. This should be initially recognised as paradoxical. How can the system be fully automatic and fully consciously controlled simultaneously? This can only be achieved by a holographic learning pattern both spatially and temporally. This mechanism has been covered previously. In this cybernetic application the 'accept' and 'reject' feedback operations simply accept the movements as correct or reject them when incorrect (to avoid that motion). To recap, we are stating that everything manifests through the different applications of this cybernetics process. This means there are two fundamental components in all of Creation: 1) CAUSE (basic control and the essence of creation---this is the observer and, yes, that includes the environment), and 2) the feedback from the results of (1), that is, EFFECT, the observed. But note that this is a duality and is resolved in the single state of the Absolute. See Note 4. How do we (or CAUSE) control the automatic feedback from the learning pattern? We/CAUSE act singularly (in 3D), for example, an intention to move the hand from A to B. For simple movements a single idea or concept is sufficient to control the result. A more complex movement, but learned, as in high skills, such as sequences of finger movements on a keyboard, the expanding learning pattern will link the single ideas of consciousness into a continuum. How can a single state of mind, control a learning pattern containing millions of computer bits with such feedback complexity? The answer to this is in the complexity of the interface design of the learning pattern, which is covered in some detail in other articles and books (see Note 3). The feedback mechanism acts like a system of grooves or like a filter or colander, directing and being cause, and dividing up singular CAUSE so that small elements (such as a finger movement) have a small focus of CAUSE to control the detail. Our attention, if it didn't merge with the feedback (holographic program), wouldn't be able to control detailed movements. We have previously used the analogy of the 'mould', which in principle is very relevant since CAUSE 'poured' into the holographic interface can still be whole but containing a pattern (holographic) imprinted within it, enabling it to direct its CAUSE precisely in every detail, producing an automatic distribution of attention. Let's take a further simple example. Hold one's hand still, then get the idea of making a small movement, say, a wave of the hand, sufficiently simple such that almost anyone has enough skill to make this movement and control it by an initial single ideation of the hand motion. How is that possible? This single idea must be translated into patterns (holographic) of computer-type bits, maybe billions of them, for well-learned hand motions. Clearly an interface system is required to convert a single state to a pattern of billions of minute elements (tiny specks of static electricity in our artificial computers, and electromagnetic (and scalar) wavelengths in the mind computer). This is achieved by means of a complex network of the triad principle. The greater the skill, or reflex ability, the more complex is this network or matrix of computer bits and the greater is the information density. In summary, and utilising Figure 1, the process of developing a learning pattern is firstly the intention of making a movement---the intention being an aspect of CAUSE. Next, CAUSE initiates the movement, which activates and enables EFFECT, the function and memory storage of the mind computer system, to not only mobilise the mechanism for sending nerve impulses to the muscles but to also store a continuous record of the movement. A kinaesthetic sensation accompanies the motion, which is experienced in the joints as a sense of movement and position (note that the theory of physiological coils in the joints discovered by science is low-level information transmission of the nervous system). The reader may have difficulty grasping how the mechanistic feedback from EFFECT can merge so perfectly with the opposite flow from CAUSE. Imagine the following analogy. If we let CAUSE be represented by a volume of liquid, say, water, we can let ice represent a solid substance. We can see that ice comes from the water by freezing water. If we imagine fine strings and clusters of ice particles in the water, we can see that they are completely compatible with the water. The water, in condensing into fixed patterns of ice, represents consciousness condensing ideas into thought structures. Let us look at the thought process. As an adult, we might be aware that thought tends to be continuous when the attention is not being specifically directed, and there is less looking (out through the senses) compared with when we were children. The organic robot self (the feedback from the EFFECT recordings) copies the experiences of CAUSE and records them, including emotions, many times a second. These memories are stored either consciously when accepted (see Figure 1, or unconsciously when rejected due to discomfort, pain, trauma (to be described in more detail later). The child has a much more active CAUSE, unadulterated by feedback. When we, as adults, think of or look at something, a mass of information in both the conscious and subconscious mind is activated, creating an influx of feedback impinging on CAUSE, with subsequent modifications to CAUSE. This modification can be trivial and insignificant, or quite the contrary, it can cause prejudice, dogma, programming and brainwashing. We have applied the cybernetics mechanism to one sense, the visual sense; a similar description will apply in the operation of the other senses. Now regarding the phenomenon of experience in general, we have at least a combination of thought and physical senses involved in all experiences. The distinction of the good and bad experience will manifest in the cybernetic loop through the components: accept or reject. Let us give an example of a particularly negative experience. Clearly the individual goes into the 'reject' mode; a state of not wanting, a non-confront of the feedback, causing the outgoing attention from CAUSE to oppose the feedback, which as stated constitutes the reject mode. The physics of the energies here is two opposing flows (the basis of a problem), which stabilises as a standing-wave function. This, we shall see, is a simple basic form of an energy pattern similar to the more complex ones of our environment, that is, matter. Thus we create by the opposition, by the resistance/rejection, a mental mass that now persists in time, containing within its wave forms all information related to the painful incident. It is stored outside the awareness of CAUSE, that is, in the unconscious (because one rejected it). Even all mild experience that one rejects will store with some lack of awareness and be forgotten. Thus the mind builds up countless such recordings, and when these past incidents have similar elements of experience to the one in the present moment, they can now be triggered-off in present time. We can see that there are really no problems in the past, only recordings, EFFECT, which feedback to CAUSE in the now, making CAUSE recreate effects anew. Now intuition is a very different attribute, not understood in current science. As an analogy, it is similar to musical ability in, say, playing a musical instrument. The technique ability is based on past learning, creating recordings, imprints of coordinated information to be used to communicate the musical expression. This is a skill, left-brain and intellectual; the information and feedback is objective relative to the inner observer, CAUSE. Intuition is completely different. It is a whole (quantum) energy state, like emotion, and is a property of CAUSE, which functions in the NOW; whereas the technique, skill mechanism or learning pattern, is based on past-acquired data, and is an EFFECT in the NOW. Musical ability and intuition are created in the NOW and are CAUSE. Compare a robot; this is totally EFFECT in the NOW---only the feedback is present and acts as a false cause, a simulation of CAUSE. Thus science does not recognise true CAUSE. Let us now show how the feedback loop operates in the scientific method, that is, the system of evaluation with emphasis on objectivity and more precisely the observer/observed relationship. This is called empiricism, that is, evaluations made from experiments; experiential rather than just mental rationalisations. However, note that there are two levels of empiricism. Science only recognises what we can call physical empiricism, as compared with the second one, which we call mental empiricism. See Figure 2. Science's physical empiricism divides the observer/observed relation at the surface of the body with its observational physical senses combined with use of scientific instruments (the observer) for measurement of the observed environment. However, as we can see from Figures 1 and 2, CAUSE is the real observer (basically separate from its own creation and subsequent feedback). Thus we have mental empiricism, and the separation of observer/observed is between the EFFECT/feedback and CAUSE in the mind. Advanced civilisations do not need the experimental method using external instruments; these races can function from CAUSE directly to both the external environment of the universe and the internal environment of the mind and body. Note that the two CAUSES (Figure 2) are different. 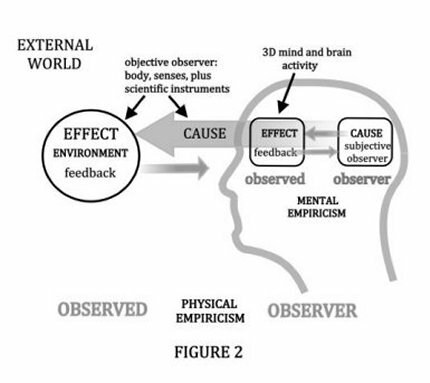 In physical empiricism, CAUSE is a composite of the mental CAUSE (right one in Figure 2), plus 3D mind/brain recordings, using mainly physical senses. In mental empiricism, CAUSE is the input to the body/brain vehicle or organic robot, and consists of recordings and learning patterns from all fractal higher orders all the way back to the Absolute. Mainstream science confines the observation process to physical empiricism, utilising the robot and technology aspects of the human being, that is, the mechanistic senses and scientific instruments. This level of observation is of the same degree of order as the structure of the observed/environment; like a machine evaluating another machine of the same degree of complexity or development. This is what Darwin was trying to point out when he made the profound statement, in the form of a question: 'How can man understand nature if man is part of nature?' He was even referring to his own theory of evolution, or any other theories. Not one percent of scientists would have understood this. He was questioning objectivity---the edifice upon which science is built. Imagine science having established the experimental method, with its rigorous requirements of objectivity; a complete separation of the observer and observed, no subjective interconnection, and then finding out according to quantum physics, objectivity is, in fact, an illusion. The personal subjectivity that science so thoroughly eradicated revealed a hidden universal subjectivity; a natural and intrinsic interrelationship between observer and observed. Nevertheless, objectivity is relative and only appears to exist---within a limited context. Thus as long as this is recognised and the laws of science are relative, progress can continue and the laws periodically updated. The human race can then be freed from our 3D conceptual entrapment. Quantum physics about 80 years ago made a similar revelation to Darwin's, which pointed out that the observer, even in the scientific method, was part of the experimental system---was not separate from or objective to what was being observed. More precisely though, it is not the observer that is part of the observed (environment/universe), unless that observer is regarded as nothing more than a physiological, chemical and bio-energetic brain and body system, which is of a similar order of energy and matter as the environment. This is not the CAUSE input in the cybernetics loop, which is the real observer that can potentially take on any degree of higher order than the environment (since it extends fractally and holographically up into the higher dimensions), and thus contrariwise, the observed is part of the observer. This is what is really meant by the quantum physics description of the observer/observed relationship, the 'I/not-I'. Note that this is physical empiricism hinting at the need for mental empiricism; see Figure 2. The letter 'I' clearly refers to the self, the individual, the observer. The term 'not-I' refers to the observed. It is not saying the environment is not the observer, since why would the 'I' be used. It does in fact mean that the observed is the 'I' but in a 'not-know' condition, that is, the environment is an extension of the mind of both the individual and the collective of the human race and other species present. Since we now have the 'not-I' description, the mental empiricism has a correspondence with science's physical empiricism. The latter, physical empiricism, is the relationship between the body level as observer and the observed environment; that is, the counteracted 'I' in the 'not-I', formed in the original creation of physical matter or energy, and subsequently space and time. This actually means that if all life was removed from the universe (all 'I's removed), the universe itself would immediately disappear. Thus physical creation, as described above, could use the same mechanisms as in the above mental empiricism---a mind (CAUSE) projecting out a thought (EFFECT) then counteracting (reversing its polarity), denying/rejecting the EFFECT and objectifying (separating out) all manifestation. We can think of man as a microcosm, the observer, within the macrocosm, the observed, or vice versa the macro within the micro, somewhat similar to the cell and DNA of the human, containing all the information for the growth and description of the whole body. There are precise correspondences from the small to the large in both the above cases. In the 'New Science' books, volume I and II, we explained the fractal system of universes in which the highest fractal order is a single state (this is logical; it passes all the tests of truth of physics  ). We can call this mind, but recognise underlying this is the Absolute. We can now see that the 'I/not-I' relation arises from the single 'I' (it is both single and collective (a singular whole)), and projects down the fractal hierarchy, forming the subjective 'I', that is, the observer, and the objective 'not-I', the observed. Next we shall consider the aging problem, but not the physiological aspects, such as deteriorating muscular performance and physiology generally. There is a similar problem already covered in the development of the learning pattern in which the more practice and development that occurs of the learning pattern, the more automatic our movements become. The graph of skill ability curves off into a plateau of no further gain, and eventually even deterioration occurs. Keep in mind Figure 1 and think of the feedback increasing with age. More and more recordings are made of every activity of CAUSE, and this recorded information not only directs CAUSE but it takes control more as the intensity of consciousness (CAUSE) and creativity reduces with age, in particular, gives way. We have already mentioned aspects of this in discussing the visual-field effects. Instead of CAUSE acting with awareness in everyday activities the robot side can handle many of these activities and the feedback gradually replaces creative thinking and acting. As a further problem and one which neuroscientists are aware of, much of this feedback at the more physical level comes from the brain (the temporary memory) but which is not recognised by science to be an interface system that steps down the frequencies of the mind and consciousness (the greater permanent memory); and the brain formats the information to align with our 3D existence. So far we have explained in some detail the feedback loop between observer and observed in the third dimension. In other material we have described the fractal holographic nature of creation  in which our consciousness (CAUSE) extends through these higher-dimensional universes back to the Absolute or Source. Figure 1 shows at the top a diminished graphic (for space economy), the next fractal universe system; the soul level. A similar analysis will apply to this level and higher ones, to the 3D cybernetic system. If we designate our universe as fractal level 1 then the soul level is universe number 2. 1. Books: The Emerging New Science vol. 1 and The New Science: A Major Paradigm Shift vol. 2. 2. Articles on fractals and The Fractal Tree, www.nhbeyondduality.org.uk. 3. Book: The Attainment of Superior Physical Abilities by N. Huntley. 4. The Absolute, the Eternal, the quantum realm of infinite possibilities and potential, a neutral state with no personalisations or individuations would be the primary state. Book: The New Science vol. 2, Chapter 6. 5. Ibid, and article, The Triad Principle, in New Education series, www.nhbeyondduality.org.uk. 6. Tests of truth in physics: books, Op. cit. : The New Science vol. 1 and 2. 7. Op. cit. Articles on fractals. 8. Book: Engaging the Extraterrestrials: Forbidden History of ET Events, Programs and Agendas.